Laver, Rod with Larry Writer. London: Allen & Unwin , 2013. First edition of Laver’s autobiography. Octavo, original boards, illustrated. 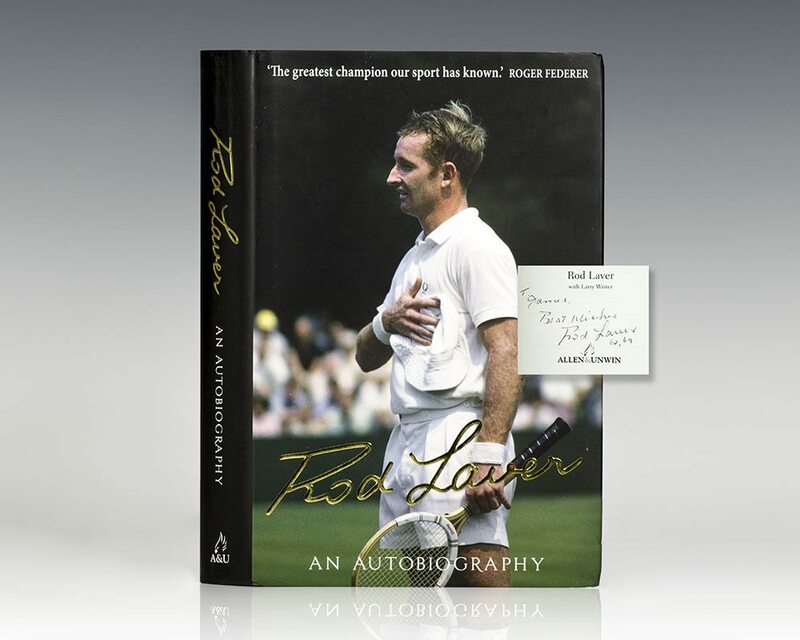 Inscribed by the author on the title page, “To James Best wishes Rod Laver 62, 69.” The dates 1962 and 1969 denote the two years Laver won all four grand slams. Fine in a fine dust jacket. Jacket design by Mark Thacker. Rod Laver's memoir is the inspiring story of how a diminutive, left-handed, red-headed country boy from Rockhampton, Australia became one of sports' greatest champions. Rod was a dominant force in world tennis for almost two decades, playing and defeating some of the greatest players of the twentieth century. In 1962, Rod became the second man to win the Grand Slam - that is, winning the Australian, French, Wimbledon and US titles in a single calendar year. In 1969, he won it again, becoming the only player ever to win the Grand Slam twice. Laver's book is a wonderfully nostalgic journey into Laver's path to stardom, from the early days of growing up in a Queensland country town in the 1950s, to breaking into the amateur circuit, to the extraordinary highs of Grand Slam victories. Away from on-court triumphs, Rod also movingly writes about the life-changing stroke he suffered in 1998, and of his beloved wife of more than 40 years, Mary, who died in 2012 after a long illness. Filled with anecdotes about the great players and great matches, set against the backdrop of a tennis world changing from rigid amateurism to the professional game we recognize today, Rod's book is a warm, insightful and fascinating account of one of tennis's all-time greats.